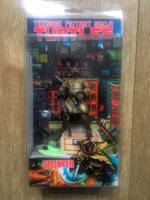 This a is complete custom dry brushed TMNT Mirage comics Splinter in NECA style figure. The head is a Mondo Splinter head resin cast. The torso and arms are from the 2017 Nick Usugi Yojimbo. Legs from a Marvel Infinte Grey Beast, hands from a bootleg movie Splinter and the tail from a Ratatouille Git figure. The „skirt” is a Spiderman 2 Doc Ock Movie coat piece. The paints used are acrylic paints with an nice clear finish. I painted the lining used on the original NECA TMNT figures to give him that look like he jumped right out of the old Mirage comics! 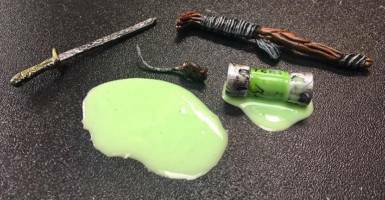 Cane (bootleg movie Splinter), sword (Gi Joe), pre-mutaded rat (cut off the 2012 Nick Rat-King shoulder), canister of ooze (2004 Splinter) and pile of ooze (Silicone rubber for mold making) are included. The package is a modified Star Wars protector case. I made the artwork using an original NECA April package and scans from the Mirage color comicbooks.